Hillary Clinton is consolidating the support of the young voters who turned out overwhelmingly for President Barack Obama in the last two elections, while the Republican field remains wide open, according to a wide-ranging new poll of 18- to 29-year-olds released Wednesday by the Harvard University Institute of Politics. The latest edition of the heralded survey found divisions over the future of the #BlackLivesMatter movement — the percentage of young white voters who support the protests is less than 40%, compared to 81% of black respondents. The poll also captures growing concerns about the threat of the Islamic State group and decreasing trust in a number of major American institutions. Young people "remain hopeful about our nation&apos;s future," Maggie Williams, director of the Harvard Institute of Politics and Clinton&apos;s campaign manager in 2008, said in a press release. "They are ready to engage in the 2016 election – from voting to volunteering – if political leaders build trust not only as candidates but also in the political process itself." Support for the #BlackLivesMatter protests is broken up along racial lines, with blacks (81%) and Hispanics (59%) backing the demonstrations and just 37% of whites in favor. Only blacks, at 60%, said they believed the protests "will be effective in making meaningful change." Overall, fewer than 4 in 10 respondents expressed confidence that the movement will have a lasting effect. 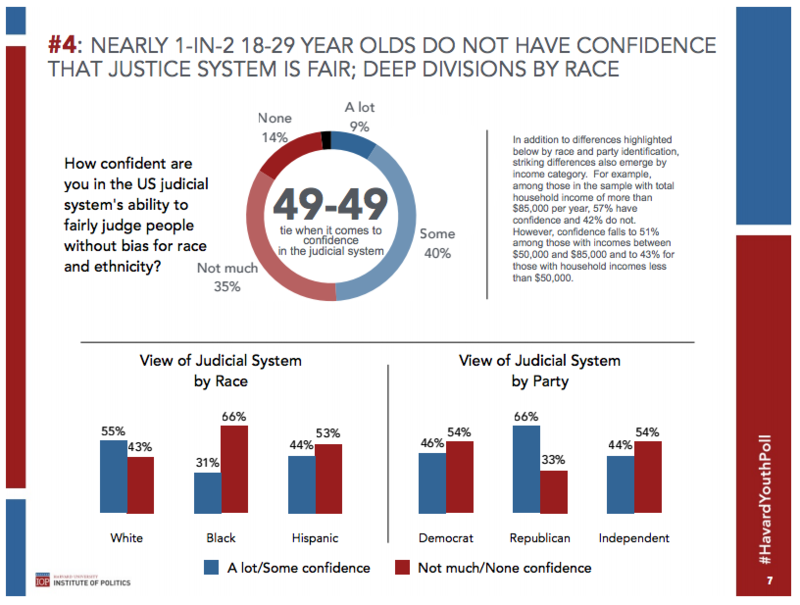 Asked what kind of trust they had in the justice system to "fairly judge people without bias for race and ethnicity," 49% of those surveyed said "not much" or "none." Only 9% replied "a lot." There was similar division over the efficacy of the movement, which began last summer in Ferguson, Missouri and continue apace in cities from California to New York and, most recently, in Baltimore. Besides Clinton, the only Democrat to score in the double digits was Sen. Elizabeth Warren (D-Mass. ), despite her repeated assertions that she will not run in 2016. Sen. Bernie Sanders (I-Vt.), who will announce his candidacy Thursday, received 1% support. With the Democratic nomination hers to lose, Clinton will be heartened by young voters&apos; overwhelming preference to see the party keep power after Obama leaves the White House. Both subgroups — 18 to 24 and 25 to 29 — prefer Democrats by a wide margin, with the older half showing stronger support, at 57%. One good sign for the GOP: Enthusiasm among young GOP voters to see a Republican win the election is right on par with their Democratic friends — 95% of registered Republicans want a Republican in office, 94% of registered Democrats want a Democrat. The real front-runner in these early days of the Republican contest is not yet clear. "Undecided" registered an overwhelming victory with 41% of respondents saying they had yet to pick a favorite. Dr. Ben Carson was the only potential candidate to score in the double digits, but he is not expected to last more than a few primaries if he decides to run. With 7%, former Florida Gov. Jeb Bush will be glad to see himself running about even with Sen. Rand Paul, who is hoping to corral young voters with his libertarian positions on criminal justice and marijuana policy reform. The divide on political engagement isn&apos;t between Democrats and Republicans, but online and off. Only 14% of registered Democrats report having attended a political rally. For registered Republicans, the number was 9%. An average of 7% from both parties said they&apos;ve actually left the house and volunteered on campaign. The U.S. military remains the most trusted American institution and the only one with a majority backing. In a 5-point spike from 2014, 53% of young voters said they trust the military to "do the right thing." Only 42% said the same of the Supreme Court. Congress was, as has become customary, at the bottom of the barrel with 17%. Young Americans trust the military so much, 57% of them want to send ground troops back to Iraq to fight Islamic State. A little more than a dozen years after the President George W. Bush&apos;s invasion and long occupation began, millennials are quickly forgetting the lessons (or ignoring the costs) of war in the Middle East. Between 2014 and 2015, support for a pre-emptive attack on U.S. enemies abroad jumped 7 points, to 23%.